Finally! the first meeting of Mathieu Dufour's amazing playing in Korea! Can you believe it? Mathieu Dufour's coming to Korea. Moreover the lucky date July 7th, he will show awesome concert with his friend flutist Erin J Bouriakov and pianist Jeonghwa Hur. July 7th 7 pm at Seoul Arts Center IBK Chamber hall. So much luck we have. So exciting...! If you come, you are so lucky. Don't miss it! 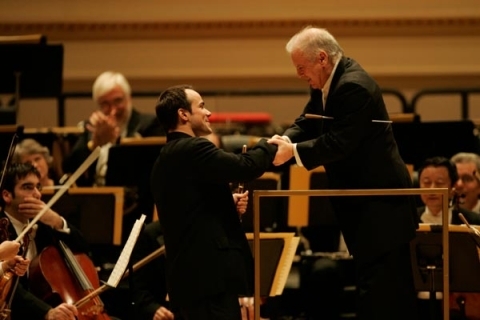 Conductor Daniel Barenboim's choice, flautist Mathieu Dufour. 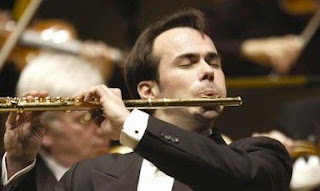 Praised as "a marvel"by the Chicago Sun-Times, French flutist Mathieu Dufour is one of the most enchanting and breathtaking musicians of his generation. His golden sound and flawless technique have left audiences and fellow musicians in awe. At the age of 25, he was appointed principal flute of the Chicago Symphony Orchestra by Daniel Barenboim, making him one of the youngest players ever to hold such a position. Since then, he has performed numerous times as soloist with the Chicago Symphony, in the concertos of Devienne, Mozart, Ibert, Bach, Jolivet, and Nielsen. Under the direction of Daniel Barenboim, his performances of Mozart’s G major concerto in at Carnegie Hall in New York and the Bach’s Second Suite at the Philharmonie in Berlin earned him rave reviews. He has performed as soloist at the Lucerne Festival in Switzerland; one critic wrote of a performance, "the ornate solo lines unfurled like yard upon yard of fine embroidered silk." As soloist, Mr. Dufour has performed with conductors such as Pierre Boulez, Christoph Eschenbach, David Robertson, Fabio Luisi and Nicholas McGegan. Of a recent performance of Nielsen’s Flute Concerto with the Chicago Symphony, the Chicago Tribune wrote, "Throughout the concerto he confirmed his uncanny mastery of color and dynamics, filling the hall with a vibrant, crystalline sound." Mr. Dufour performs concertos and recitals every year in Japan. He has performed recitals in major halls in Tokyo and concertos with the Tokyo Metropolitan Orchestra and the Hiroshima Symphony. As chamber musician, he has collaborated with Mitsuko Uchida, Pinchas Zukerman, the Kalichstein-Laredo-Robinson Trio, Julia Fischer, Eric LeSage, and members of the Berlin Philharmonic. He is also a member of the Chicago Chamber Musicians. He has performed chamber music concerts in Carnegie’s Zankel Hall in New York and at the Lucerne Festival, the Davos Festival in Switzerland, and the Domaine Forget Festival in Canada. He is in demand around the world as a recitalist and has dazzled audiences in Japan, the United States, Canada, Europe, Israel, and South America. His recitals have been televised on the Mezzo French channel and on Japanese television. 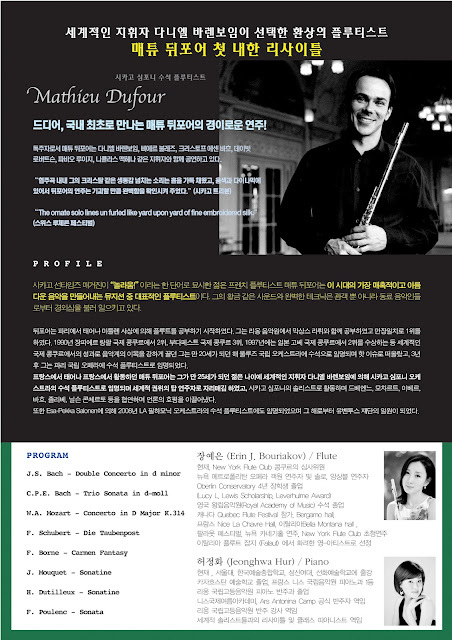 Mr. Dufour was born in Paris, and he began his flute studies with Madeleine Chassang. He then studied with Maxence Larrieu at the Lyon Conservatory, where he was unanimously awarded first prize. He won second prize at the Jean-Pierre Rampal International Flute Competition in 1990, third prize at the International Flute Competition in Budapest in 1991,and second prize at the International Flute Competition in Kobe, Japan, in 1997. At the age of 20, he was appointed principal flutist of the Orchestre National du Capitole de Toulouse, and three years later he became the principal flutist of the Paris National Opera. He was also a member of the Juventus Foundation. Mr. Dufour is also highly in demand as a teacher, although his concertizing permits him time for very few students each year. He is passionate about teaching the young generation of musicians, frequently giving master classes wherever he performs. He has taught many times at the Domaine Forget Festival in Canada. He is currently on faculty at DePaul University in Chicago. In 2009-2010, Mr. Dufour performs Dalbavie’s Flute Concerto with the Chicago Symphony in Chicago and at Carnegie Hall under the direction of Pierre Boulez. Mr. Dufour’s discography includes a solo recital of sonatas by Prokofiev, Martinů, and Hindemith on Harmonia Mundi; Poulenc’s complete chamber music on RCA/BMG; the complete works for flute by Roussel on Saphir Records; and Molique’s concerto with the Czech National Orchestra on Cedille Records. In 2010 he releases a CD of fantasies for flute and piano by Taffanel, Fauré, Doppler, Hüe, Gaubert, and Borne on Cedille Records. Accompanist for world wide flutists. (Henrik Wiese, Ueno Seiya, Michel Moragues, Paul E.Davies, Jeanne Baxtresser, Alberto Almarza, Philippe Pierlot, Julian Beaudiment)in Korea. 환상의 플루트 연주자 매튜 뒤포어 첫 내한 리사이틀! 드디어, 국내 최초로 만나는 매튜 뒤포어의 경이로운 연주! 독주자로서 매튜 뒤포어는 다니엘 바렌보임, 삐에르 불레즈, 크리스토프 에센 바흐, 데이빗 로버트슨, 파비오 루이지, 니콜라스 맥헤나 같은 지휘자와 함께 공연하고 있다. 최근 시카고 심포니와 함께 닐슨의 플루트 협주곡 협연 때 Chicago Tribune은 “협주곡 내내 그의 크리스탈 같은 생동감 넘치는 소리는 홀을 가득 채웠고, 음색과 다이나믹에 있어서 뒤포어의 연주는 기괴할 만큼 완벽함을 확인시켜 주었다.” 라고 썼다. 다니엘 바렌보임 지휘 하에 뉴욕 카네기 홀에서 모차르트 협주곡 G Major를, 바흐 모음곡을 베를린 필하모닉과 함께 협연하며 격찬 받았으며 또한 스위스 루체른 페스티벌 초청 솔로 연주는 “The ornate solo lines un furled like yard upon yard of fine embroidered silk.” 라는 리뷰로 크게 찬사 받았다. 2009년에서 2010년까지는 Dalbavie의 플루트 협주곡을 Pierre Boulez의 감독하에 시카고 심포니와 시카고시, 카네기 홀에서 연주하며 호평 받았다. 뒤포어는 일본의 정상급 공연장에서 매년 독주회를 갖고 있으며 도쿄 메트로폴리탄 오케스트라와 히로시마 심포니 등과도 함께 협연 무대를 가졌다. 그는 Mitsuko Uchida, Pinchas Zukerman, the Kalichstein-Laredo-Robinson Trio, Julia Fischer, Eric LeSage, 그리고 베를린 필하모닉의 단원들과 앙상블 연주 활동을 펼치고 있으며 시카고 챔버의 단원으로도 활동하며 솔리스트로서 뿐 아니라 앙상블 주자로서도 호평 받고 있다. 뉴욕 카네기 홀의 Zankel, 루체른 페스티벌, 스위스 다보스 페스티벌, 그리고 캐나다 Domain Forget Festival 에서 실내악 연주회를 가졌다. 미국, 캐나다, 일본, 유럽, 이스라엘, 남미에서 열렸던 뒤포어의 독주회는 전세계 관객들을 황홀케 했으며 이런 그의 놀라운 연주는 Mezzo French 채널을 통해 방영되었고 일본 NHK 방송을 통해 일본 전역에서도 중계되었다. 시카고 선타임즈 매거진이 “놀라움!” 이라는 한 단어로 묘사한 젊은 프렌치 플루티스트 매튜 뒤포어는 이 시대의 가장 매혹적이고 아름다운 음악을 만들어내는 뮤지션 중 대표적인 플루티스트이다. 그의 황금 같은 사운드와 완벽한 테크닉은 관객 뿐 아니라 동료 음악인들로부터 경외심을 불러 일으키고 있다. 뒤포어는 파리에서 태어나 마들렌 샤상에 의해 플루트를 공부하기 시작하였다. 그는 리옹 음악원에서 막상스 라뤼와 함께 공부하였고 만장일치로 1위를 하였다. 1990년 장피에르 랑팔 국제 콩쿠르에서 2위, 부다페스트 국제 콩쿠르 3위, 1997년에는 일본 고베 국제 콩쿠르에서 2위를 수상하는 등 세계적인 국제 콩쿠르에서의 성과로 음악계의 이목을 강하게 끌던 그는 만 20세가 되던 해 뚤루즈 국립 오케스트라에 수석으로 임명되며 핫 이슈로 떠올랐고, 3년 후 그는 파리 국립 오페라에 수석 플루티스트로 임명되었다. 프랑스에서 태어나 프랑스에서 활동하던 매튜 뒤포어는 그가 만 25세가 되던 젊은 나이에 세계적인 지휘자 다니엘 바렌보임에 의해 시카고 심포니 오케스트라의 수석 플루티스트로 임명되며 세계적 권위의 탑 연주자로 자리매김 하였고, 시카고 심포니의 솔리스트로 활동하며 드베엔느, 모차르트, 이베르, 바흐, 졸리베, 닐슨 콘체르토 등을 협연하며 언론의 호평을 이끌어냈다. 또한 Esa-Pekka Salonen에 의해 2008년 LA 필하모닉 오케스트라의 수석 플루티스트에도 임명되었으며 그 해로부터 유벤투스 재단의 일원이 되었다. 뒤포어는 프로코피예프, 마르티누, 힌데미츠 소나타를 포함한 음반을 Harmonia Mundi에서, 쁠랑의 챔버 뮤직을, RCA/BMG에서, Roussel의 플루트 작품들을 Saphir Records에서, 그리고 체코 국립 교향악단과 연주한 Molique협주곡을 Cedille Records를 통하여 발매해 왔다. 또한 2010년에는 타파넬, 포레, 도플러, 휴, 고베르, 그리고 보네의 플루트와 피아노를 위한 판타지 음반을 Cedille Records를 통해 출반하며 음반작업에도 몰두하고 있다. 그는 역시 연주 활동에 그의 대부분의 시간을 할애하지만 세계의 매우 많은 연주자와 학생들이 그의 놀라운 연주에 경의를 표하며 그에게서 배우기를 원하고 있다. 뒤포어는 미국에서 뿐 아니라, 유럽, 남미, 일본 등 세계 각지를 순회하며 수많은 마스터 클래스를 개최하여 왔고, 젊은 음악인들을 가르치는 것에 대한 열정을 보여주고 있다. 캐나다에서 열리는 음악축제인 Domaine Forget Festival에서 그는 여러 번 교수로서 초청되어 왔고, 또한 현재 시카고에 있는 De Paul 대학에서도 후학을 양성하고 있다. Master Classes on July 4,5,8,9 !